If you're wondering how Virginia Tech could come so close to beating Boise State, 33 to 30 ten days ago, but stunningly lose at home, 21 to 16 against James Madison, you simply must read the blog post by Mike Kuchar, The Defensive Coordinator at North Brunswick Township High School in New Jersey, as prepared for and presented at Chris Brown's excellent Smart Football Blog. To give the Clift Notes version of what Coach Kuchar wrote before the link to it, Virginia Tech broke down Boise State Offense on film in detail and a full five months before their September 6th opener. Coach Kuchar was given the opportunity to be a part of the analysis process. What was learned was that, first, Head Coach Chris Peterson's approach is to have not an offensive system, but a collection of plays for given situations. Second, Boise State uses leverage, numbers, and grass to "gash the opposition." That is, "leverage" is using shifts and motion to gain a "numbers" advantage at the point of attack, to run a running play that gashes the defense, at times for big gains. What the Broncos do is use a tight-end plus a wingback to add an extra hole for the defense to worry about. If the defense overloads and overruns this set, their running backs are coached to cut back to the weakside. In the passing game, Boise State also uses the overload concept, employing a 3 x 1 formation, but then motioning the back to the strongside so we have a 4 x 1 set: if the safeties go to the "4" side, Boise throws to the Split End, or the "1," on the weakside. There's a lot more in Coach Kuchar's account, which you can read with a click here. But Virginia Tech's preparation was the reason they almost beat Boise State and arguably the reason they lost to James Madision, thus contributing to Boise State's drop in the polls this week. This just in: on The Dan Patrick Show this morning, USC Athletic Director Pat Haden said that if he were New Orleans Saints and former USC Running Back Reggie Bush, with Pat Haden's soul, he would return the Heisman Trophy he won in 2005. "If I were Reggie Bush with Pat Haden's soul, I would say yes. Reggie Bush was a great player, an exciting player. But the NCAA report says that we must disassociate ourselves from Reggie." This is USC officially throwing Reggie Bush under the bus. Now, it's all over the place with ESPNs Erin Andrews blasting the news out on radio. To recap, Reggie Bush won the Heisman in 2005, but with USC suffering from severe NCAA sanctions including a 2-year postseason ban, loss of football scholarships, and the vacating of wins in the 2004-05 championship season, in the wake of alleged improper gifts to Bush, much has changed. Mike Garrett was fired as athletic director at Southern Cal, and replaced by USC Football Quarterback and NFL Analyst Pat Haden. Pat Haden has waisted no time in trying to disassociate USC from Reggie Bush, a totally impossible task. In the wake of the NCAA's sanctions against USC for alleged violations in its football and basketball programs, and as USC's athletic administration led by USC Athletic Director Mike Garrett, digs in, circles the wagons, and prepares for an appeal, some USC donors who talked to this blogger are not pleased at all with the situation, and are using it to speak their displeasure with not just USC's Garrett, but former USC Football Coach Pete Carroll. One donor who's met Carroll several times, has had a major role in giving to the USC program, and has been a visitor to the USC Football practices on several occasions said on Sunday "I could just walk into the practices and no one asked who I was. I could have had a $1,000 cash and no one would know." The USC donor says that while Pete Carroll claimed disappointment with the NCAA action, and lack of knowledge of how the actions that were the focus of the punishment could have happened, on some level it was hard to see how he could not know or have some idea that something was going on with Reggie Bush. After all, he was the head coach. "This puts a cloud over everything that's happened in the past," my USC donor friend said. Another USC Donor friend, in a conversation Saturday in San Francisco's Marina District, said "I think Mike Garrett should go" but focused more on their dislike for Garrett's style rather than any substantive argument. Still, it's clear the NCAA sanctions against USC have given Mike Carrett's enemies reason to strike, and they're doing so. Mike Garrett, for his part, is fighting back, according to ESPN's Diamond Leung. In a blog, Diamond Leung noted that Garrett "had this to say when I approached him before the start of the event: “No comment. Don’t bother me. The world is great.” Then Leung noted "While walking away with associates, he (Garrett) said, 'Don’t talk to that guy. He’s the press.'" Garrett's best action is openness - with his friends, his enemies, and the press. 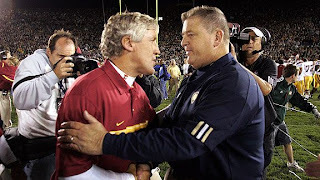 It's not fair that Garrett's left to fight the USC battle alone while Pete Carroll escapes scot free. The word that's coming in here is that Mike Ornstein (currently working with 49ers Legend Joe Montana), may have been asked by Pete Carroll to work with his football program. ...How many players, I don't even know, maybe he tried to get him to hire ten....but it was totally agreed upon between (the former head football coach) and (sports marketer A) that there was an internship program for that summer. That's all I do know. 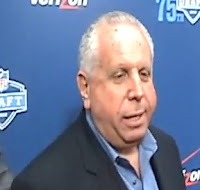 In retrospect, it did not occur to me to ask Mike about the USC issue at the time and until three hour later after the NFL Draft started when it fully dawned on me that Mike Ornstein was the Mike Ornstein. But then, there were a number of "seasoned sports journalists" there, who didn't ask him any questions at all; I asked about sports marketing in this economic climate. I digress. Seattle Seahawks Head Coach Pete Carroll should come out and say what he knows, because its clear he knows something and time will reveal what that is. By not saying anything, Pete Carroll places Mike Ornstein in the position of being able to "out" Carroll if he wants to. If Ornstein denies that Carroll asked him to participate in the football program, the question is "If not Pete, then who did?" This story gets more complicated with every turn. The National Collegiate Athletic Association, via a source to ESPN, is set to announce that it is going to strip the University of Southern California or "USC" of the ability to play in a bowl game for two years, a forfeiture of wins at least from the 2004 season and possibility the loss of the 2004 National Championship. All of this after an investigation of activities in football and basketball, and related to former students Reggie Bush and O.J. Mayo, was completed. But in light of the NCAA investigation and its decision to essentially destroy USC Football as we've known it, now it seems that Pete Carroll knew this was coming, even as he told Dan Patrick on The Dan Patrick Show that he "would be surprised" if the NCAA took any action. Well, Pete Carroll has to express surprise now, but really also has a lot of explaining to do. This level of punishment is too great for Pete Carroll to avoid. He should talk about it, and soon. Indeed, he will have to at some point. And one has to wonder what former Notre Dame Head Coach Charlie Weis thinks of this news. Weis famously implied that Pete Carroll gets a pass from the media, and dropped an allegation about Pete Carroll that he later retracted. But it's clear Pete Carroll has not been one of Charlie Weis favorite people because he thinks Weis got special treatment from the media. Also, how does the NCAA action impact the 2010 Pac-10 race, which was already wide open? Does Cal or Stanford have an open shot at the Pac-10 title? Will the Cal Stanford Big Game finally have real meaning for the first time in years?